This is the fifth (and final) blog post in this series about creating your first robot with ROS and Ubuntu Core. In the previous post we discussed methods of control, did a little math, and wrote the ROS driver for our robot. But it still required several nodes to be running at once, and sharing it with the world involved uploading your source code somewhere and convincing people to install ROS, build your package, and use it. Today we’re going to simplify both of those issues by discussing ROS launch files, and packaging everything we’ve written as a snap that can be installed by your friends with a few keystrokes, even without knowing anything about ROS. You know what snaps are, and have completed the “create your first snap” tutorial. In parts 3 and 4, we needed to open several terminals because we needed to run several different ROS nodes. It’s difficult to remember every component of our system, and it gets exponentially harder as we start adding parameters, etc. Running individual nodes is handy for testing things out, but we’re done with that step. It’s time to make our system a little more of a product, something you can just run and use to control your robot. As you learned in the eighth ROS tutorial, ROS has a tool for dealing with this: launch files. These give us a simple language we can use to specify what nodes need to launch at the same time, and with what parameters. In order for our robot (and launch files) to be reusable, we’re not actually going to create a single launch file. We want a single entry point (i.e. we want to be able to launch a single launch file and have it bring up the whole system), but we also want to keep things as modular as possible. So we’ll write one launch file per subsystem, and then one super launch file in charge of bringing up the entire system. We have two subsystems for our robot: low-level control, and teleoperation. Let’s write our “super” launch file first. That’s it. All this launch file does is “include” the launch files for our two subsystems (which we have yet to write). When this launch file is run, it runs those. Alright, let’s get started on our subsystems’ launch files. Why are we splitting these up, exactly? Let’s say in the future you want to work toward making this robot autonomous. In that case, you may no longer want the teleoperation nodes to be launched. Do you think you’ll remember which nodes relate to teleoperation and which don’t? I certainly won’t! It’s easier just to keep related pieces together, and remove the “include” line that launches the teleoperation nodes if you want to remove that functionality. This file launches the two nodes that make up our teleoperation (i.e. what we discussed in part 3). Note that we’re using the autorepeat_rate parameter of the joy node. This parameter tells joy to rebroadcast joystick values, even if they haven’t changed, at a rate of at least 1 Hz (if the joystick moves, the rate will be much greater than 1 Hz, we just want to make sure we don’t run into our driver’s timeout functionality if the joystick simply hasn’t moved). We’re also using the scale_angular parameter of the teleop_node so the robot actually turns (as we discussed in part 4). This one is tremendously simple, as it’s just launching the driver we wrote in part 4. No parameters to tweak, since the default values are suitable (at least for my robot, perhaps yours is different). You’ll see all the nodes that make up our system come up, and you should be able to control your robot. So much easier than running them all individually! At this point, we have our entire ROS system launchable by a single command. Wouldn’t it be neat to have this system running as soon as we boot our Raspberry Pi? Also, it would be cool to ask your friends to take your version of this series for a spin, and be able to test theirs out as well! Both of these are easily accomplished by packaging our ROS system as a snap. Note that the workspace (and snapcraft.yaml) used here is available for reference. Now when we install our ROS package, it will install both our driver node as well as the launch files we’ve written. A ROS system for teleoperating the EduKit #3, the robotics kit. This is just useful metadata for our snap. The name must be unique (that’s why I put my nickname at the end), but you’re pretty much free to put whatever you want for the rest. The description here hints at confinement, which we’ll cover in a moment. grade can be either stable or devel. If it’s devel, the store will prevent you from releasing into stable channels– think of it as a safety net to prevent accidental releases. If it’s stable, you can release it anywhere. confinement can be strict, devmode, or classic. strict enforces confinement, whereas devmode allows all accesses, even those that would be disallowed under strict confinement (and logs accesses that would otherwise be disallowed for your reference). classic is even less confined than devmode, essentially running exactly like something you’d install from a deb. There is more extensive documentation on confinement available. I personally always use strict confinement unless I know for sure that the thing I’m snapping won’t run successfully under confinement, in which case I’ll use devmode. I typically avoid classic unless I never intend for the app to run confined (e.g. if I was snapping vim, I know it would always need access to everything). In this case, this snap can run quite well under strict confinement. We’ll discuss this some more momentarily. This is where we tell Snapcraft how to build our Catkin workspace. Every snap is made up of a number of parts. In our case, there’s only one, called workspace. We say that it’s built using the catkin plugin, using kinetic (as opposed to Lunar or Indigo, as we discussed in part 2). We give it a list of Catkin packages to build, in this case just edukit_bot. Finally, we give it a list of packages that need to be installed in order to build our ROS package, or more specifically, our RPi.GPIO dependency. Here we expose our single launch file that brings up the whole system. We create a new app called “launch” that runs the roslaunch command we used in step 4. We’re saying that this should be running at boot with daemon: simple. Finally, we provide a list of plugs, which is where confinement comes into play. Since this snap is strictly confined, by default it doesn’t really have access to anything. No network, no GPIO, no controller. So we add plugs for each of those things: ROS needs the network for its nodes to function, we need access to the controller, and we need access to GPIO. Read more about interfaces. That’s it! Let’s build it. Note that the Raspberry Pi is not as blazingly fast as we’d all like it to be. This will take some time. You’ll see Snapcraft fetch rosdep, which is then used to determine the dependencies of the ROS packages in the workspace. This is only edukit_bot in our case, which we know depends upon rospy, geometry_msgs, python-rpi.gpio, joy, and teleop_twist_joy. It then pulls those down and puts them into the snap along with roscore. Finally, it builds the requested packages in the workspace, and installs them into the snap as well. At the end, you’ll have your snap. Now you should be able to drive your robot around as before, but everything is running out of that single snap. All you need to do to share your project with others is release the snap in the store! Assuming that name is available, you can proceed to upload it. Otherwise you may need to rename/rebuild your snap to whatever name you managed to register (i.e. change the name field in the YAML and run snapcraft again, it won’t take long). That’s all, folks! I hope you enjoyed this series, and I hope that this brief introduction to professional robotics will serve you well in the years to come. If this is a field that you’d like to pursue, I can’t recommend internships enough, especially if you’re at the university level. At this point, you can put experience with ROS and Ubuntu Core on your resume, which will help you stand out from the pack! 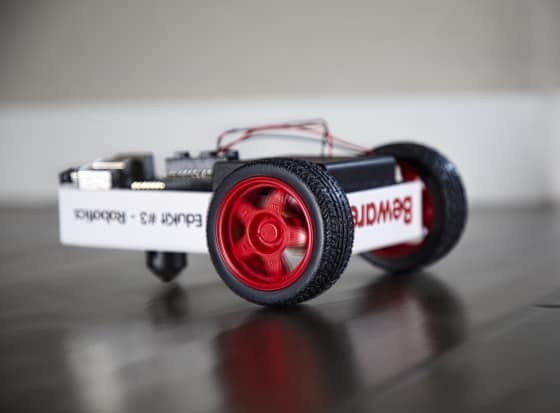 If you’re looking for ways to continue hacking on this robot using ROS, I suggest doing some research into ways to obtain the wheel speeds. Once you have that, you can start investigating morphing your driver node into something you can use with the diff_drive_controller, which goes back to ros_control, which we discussed in part 4. Who knows, maybe I’ll write another series about that someday.